Since ancient times people have searched the heavens for information on the present andfuture. The primary product of such searching has been astrology and its cataloging of the regular movements of stars and planets. However, speculation has also flowed around less regular events—meteors, eclipses, and comets. Because they occurred less often and were spectacular displays when they did, they were seen as particularly important as signs of blessing and woe. Meteors were generally thought to presage happy events, as were stellar events such as super novas. There was some foreboding over eclipses and even dread with a brilliant comet. Throughout the early years of Christendom, comets were seen as indicative of catastrophes, even the downfall of empires, a belief that gained the approbation of a number of leading thinkers throughout the centuries. Illustrative of this belief is one folktale that Pope Calixtus III (r. 1455–1458) excommunicated a comet as an instrument of the devil. He was possibly aware of the coincidental 1066 appearance of Halley’s Comet with the Battle of Hastings, in which William the Conqueror seized the British throne from King Harold. The comet was said to portend war and the death of kings. As late as 1836, Halley’s Comet was blamed for the deaths at the Alamo. By the twentieth century, the science of astronomy began to assert itself. Although discovery of the poisonous nature of the gases in the tails of comets initially increased paranoia, astronomers eventually succeeded in reducing comets to the mundane in the eyes of most people. The public education was not altogether successful, however. In the late twentieth century, religious connotations associated with comets began to take shape with the appearance of Comet Kohoutek in 1973 (a comet notable as the first in several decades that would be seen by a majority of humankind). The comet proved less than spectacular, and the predictions that had been made about changes to the Earth did not come to pass. In the spring of 1997, while most people were enjoying the show that Comet Hale-Bopp was putting on, a small group in Rancho Santa Fe, California, was watching it for quite different reasons. The Heaven’s Gate group celebrated what was to be the occasion of transcending their human existence. When catastrophe did not overtake the Earth, in March of that year, thirty-nine members committed suicide. 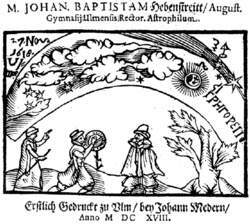 Religious and apocalyptic speculation concerning comets has continued to the present, although it has been pushed to the fringe of popular culture. Chambers, G. F. The Story of the Comets: Simply Tod for General Readers. Oxford: Clarendon Press, 1909. Kronk, G. W. Comets: A Descriptive Catalog. Hillside, NJ: Enslow Publishing, 1984. Moore, P., and J. Mason. The Return of Halley’s Comet. New York: W. W. Norton & Company, 1984. Schechner Genuth, Sara. Comets, Popular Culture, and the Birth of Modern Cosmology. Princeton, NJ: Princeton University Press, 1997. White, Andrew D. A History of the Warfare of Science with Theology in Christendom. New York: Appleton and Co., 1897. Reprint, New York: Dover, 1960. A detail of the title page from a publication dealing with a comet from 1618. Reproduced by permission of Fortean Picture Library. A comet (from the Greek word kometes, meaning “longhaired”) is a celestial body composed of ice, rock, and frozen gases that has been quaintly described as a dirty snowball. Almost all comets observed from Earth are part of our solar system, following long elliptical orbits that bring them from outside the orbit of Pluto, close to the Sun, and then back beyond Pluto. Many become involved with gravitational forces in the planetary system, so that they subsequently follow paths that keep them considerably inside Pluto’s orbit—some even become trapped inside Jupiter’s orbit. The so-called tail of a comet is produced when the comet passes close enough to the Sun for sunlight to heat it up, causing gas and dust particles to escape from the nucleus and form a glowing tail. As extraordinary heavenly phenomena that did not appear to follow the same regular patterns as the stars or the planets, comets were traditionally regarded as signs of unusually important events. In Western countries in particular, they were regarded as omens of disaster—such as plagues, famines, and war. In China, they were also traditionally regarded as omens—either good or evil. To modern people who rarely look at the night sky—much less ever having seen a comet—this explanation appears unreasonable. To understand ancients’ response to comets, one must empathize with them and understand that they saw celestial events as messages from the gods. Furthermore, our generation has not had the opportunity to view any truly spectacular comets—fiery visitors that in times past lit up the night sky with a spectacle of brilliance exceeding the glow of a full Moon. With these considerations in mind, it is easier to understand the response of the French surgeon Ambroise Paré to a comet that appeared over Europe in 1528: “It appeared to be of great length and the color of blood. At its summit was visible the figure of a bent arm, holding in its hand a great sword as if ready to strike. On either side of the tail were seen a great number of axes, knives, and bloodstained swords, among which were hideous human faces with beards and bristling hair.” The comet was horrible and produced such great terror among the common people that many died of fear and many others fell sick, as noted in David Ritchie’s book Comets: The Swords of Heaven. Many meteors are constituted from the residue of comets. This residual matter is drawn into Earth’s gravitational field, burns up as it passes through the atmosphere, and occasionally creates a visible flash that we call a falling or shooting star. Less frequently, enough mass is left after the journey through the atmosphere for a meteor to actually strike the surface of Earth. In this situation, the meteor becomes a meteorite. Despite the importance that earlier generations of astrologers attributed to comets, modern astrologers have tended to ignore them. However, ephemeredes of such well-known comets as Halley’s exist, so it is possible to place at least these in horoscopes and study their influence. It is also relevant to note that Chiron—a large planetoid orbiting between Saturn and Uranus that has been given an extraordinary amount of attention by contemporary astrologers—is a comet. It is thus entirely possible that comet studies will find a place in modern astrology in the not-too-distant future. Brandt, John C. Comets: Readings from Scientific American. San Francisco: W. H. Freeman and Co., 1981. Krupp, E. C. Beyond the Blue Horizon: Myths and Legends of the Sun, Moon, Stars, and Planets. New York: HarperCollins, 1991. Ritchie, David. Comets: The Swords of Heaven. New York: Plume, 1985. Short-period comets (orbital period P < 200) average number of apparitions per year: 17 typical discovery rate per year for new comets: 6 average semi major axis: 5. Two other known comets, called 133P/Elst-Pizarro and P/2005 U1, show similar behavior and orbits. When a space probe collected samples of dust from a comet, it returned to Earth with some surprises. We learned from last year's loss to the Houston Comets and it only made us stronger. For this survey I examined all comets that have appeared since the beginning of the 20th century on up to the present time. Generally speaking comets were considered to be portents of disaster. There, the grains could have been incorporated into fledgling comets. Comet dust and the remains of exploded stars hurtled into Earth's atmosphere and landed safely in the Utah desert last month. The Sparks won the game on the boards, outrebounding the Comets 41-31. To make Aerogel an effective comet catcher, Tsou altered the foam's density. This has been true for all bright comets of the famous Kreutz sungrazing family that have survived their fiery encounters with the Sun, as well as for several others making close Sun passes. I don't know if it's the Comets uniform or what, but she always does a good job against us.